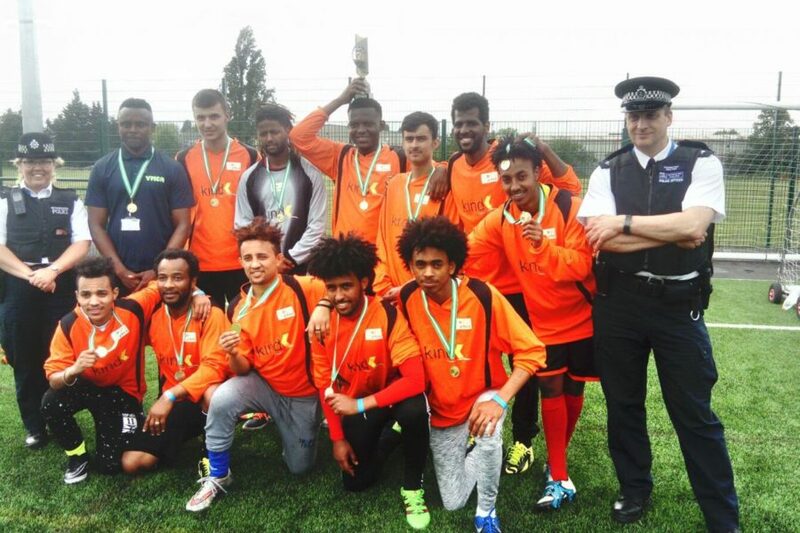 Our residents football team is made up of around 35 residents at YMCA Walthamstow (formerly YMCA East London). It’s a great way to keep fit and make friends: ‘Playing with the residents football team helps me to remain calm and focused when feeling lonely and anxious,’ says Awet. The residents football team trains twice a week in the sports hall at YMCA Walthamstow with their coach Wuga Birabe, who is a former resident himself. Wuga arrived in the UK in 2014 and is originally from Nigeria. He played as a professional footballer in Nigeria, Cyprus and Poland, before sustaining a knee injury. On arriving in the UK he started to pursue a career in football coaching and has achieved the FA Level 2 in Coaching Football, FA Welfare Officer and FA Youth Module 2. The team is made up of residents aged between 19 and 30 with different nationalities; many are refugees from Eritrea and English is not their first language. As a consequence, they feel isolated and find it difficult to integrate. But they all love football! It’s helping them to express themselves because it offers neutral ground where everyone can relate. ‘I love football so much, I feel extremely happy when I am playing football with my fellow residents,’ says Moses. The team has played couple of friendly matches with other YMCAs and also with the Tottenham Hotspur development team. They have already played in two tournaments in 2017 and won the Daniel DE-Gale Cup in May. The team is officially affiliated with London Communities Football League and with the London FA and plays its first league match on 12 November. What’s more, the team has been nominated for an award as part of the Feel Good Waltham Forest Sport Awards 2017 for Club of the Year on Thursday 16 November – fingers crossed for a good result!